There is a general feeling among Maldivians, partly as a result of a regime-driven propaganda campaign, that the current process of constitutional reform in the Maldives is the result of a home-grown initiative of the head of the regime. There are others who feel that it may have something to do with the shooting of prisoners by the regime or the outcome of political pressure from an overseas-based opposition group. 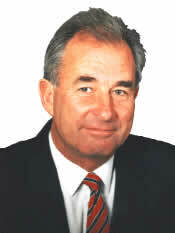 Investigations by this website have revealed that the current constitutional reforms were initiated as a result of direct pressure from the Commonwealth, the Secretary General of which is New Zealand's former Deputy Prime Minister the Right Honourable Mr. Don McKinnon. Those reforms are directly related to sections 7, 8 and 9 of the Abuja Communiqué (copied below in the inset) agreed to by the Commonwealth member states in December 2003 after months of deliberations by officials. This Communiqué refers to fundamental political values the Commonwealth seeks to implement in member states that will promote democracy, eliminate all forms of corruption, stop human rights violation and police brutality, prevent misuse of public funds and international aid, and to bring to an end organised crime such as terrorism, money laundering and drug trafficking. Countries within the Commonwealth that do not comply with the maxims of this Communique could face suspension and economic sanctions from the organisation. There is too much foreign aid at stake to allow this to happen. In this Age of Information, any attempt at claiming that current constitutional reforms in the Maldives are the result of the magnanimity of the current regime is a dishonest exercise that will end in futility. Such an attempt would also be a breach of the fundamental political values agreed to in Abuja. Heads of Government reaffirmed their commitment to the fundamental political values of the Commonwealth as set out in the Singapore and Harare Declarations and subsequent CHOGM Communiqués, and reinforced by the Millbrook Action Programme. They reiterated their commitment to non-racism, international peace and security, democracy, good governance, human rights, rule of law, the independence of the judiciary, freedom of expression, and a political culture that promotes transparency, accountability and economic development. Heads of Government endorsed the recommendations of their Law Ministers on Commonwealth Principles on the accountability of and relationship between the three branches of Government. They acknowledged that judicial independence and delivery of efficient justice services were important for maintaining the balance of power between the Executive, Legislature and Judiciary. Heads of Government expressed their full support for the good offices role of the Secretary-General in conflict prevention and resolution, and post-conflict reconstruction and development. They also expressed their continuing support for the Commonwealth Secretariat's work for strengthening democratic institutions, processes and culture. They acknowledged the value of election observation, provision of technical assistance and training and other activities. They welcomed the Secretariat’s collaboration with the Commonwealth Parliamentary Association, the Commonwealth Local Government Forum and other relevant organizations to promote best democratic practice. 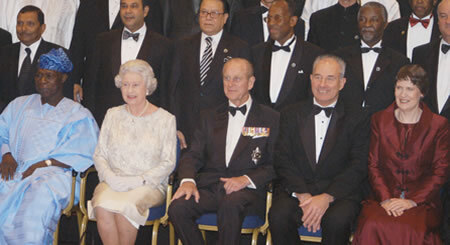 The Commonwealth Heads of Government Meeting in Abuja, Tanzania 2003. Standing on the far left is the Maldive regime's delegate, Fathullah Jameel Abdulla. One of the many fundamental political values noted in the Abuja Communiqué is the "Rule of Law". It is important to comment on this concept as it is a concept that is much misunderstood by educated Maldivians of all levels and persuasions. There seems to be a belief that the Rule of Law means compliance with legislation, edicts, proclamations, regulations, administrative precedents and political practice. Given that definition (if considered to be correct), the Ayatollah Khomeini, Adolf Hitler, Saddam Hussein and Mullah Mohamed Omar would have claimed to have governed under the Rule of Law. The Rule of Law is a complex legal concept that evolved in Common Law jurisdictions such as England and Wales, Scotland, New Zealand, Australia and Canada over many centuries. The following is an extract from a publication by the New Zealand Ministry of Justice that briefly outlines what the Rule of Law means. a person should not be deprived of his or her liberty, status or other substantial interest without the opportunity of a fair hearing before an impartial court or tribunal. Another important political value referred to in the Abuja Communiqué is “Good Governance”. The New Zealand Government runs a global programme to promote good governance, through the promotion and protection of human rights, participatory development, and peace and social stability, at regional, national and local levels. It is not known why one of the officials who came to be trained by us under the Good Governance Programme- Global attended three times. To this end the New Zealand Government has hosted and trained several high-ranking officials of the Maldive regime. A person by the name of Mohamed Hussain attended three times and a certain Asim and one Abdulla Shahid Jameel attended once each. These officials are based at the Maldive regime's office of the president of the republic. Surprisingly, it took 17 years and millions of dollars in local funding and foreign aid to draft the current Maldive constitution. It has taken barely seven years to make this “structure built on loose sand” totally obsolete as predicted in this website nearly 3 years ago. Someone has to take responsibility for this mammoth failure. The least that the current lawmakers could do is to make note of the gross legislative negligence that resulted in this fiasco in the preamble to the new constitution. Will the proposed reforms succeed? There is no proposal for parliamentary privilege. Members who express their opinions in parliament could still be handcuffed and thrown into prison and beaten into cripples as per the current practice. Alternatively private litigations could be brought against them mainly for alleged libel or defamation. While there are suggestions that the Judiciary will function independently from the Executive and Parliament, there is no suggestion of any security of tenure for the Judges. Neither is there any suggestion of Judges not being subject to criticism and influence by the Executive and Parliament. Abdul Aziz Mohamed (this writer's uncle-in-law) was a member of the Maldive Parliament in the early 1980s, during the tenure of the current regime. He thought fiscal accountability applied to all sectors of the regime and asked for a breakdown of the budget for Mulee-Aage, then official residence of the head of the regime. There are no proposals to allow judicial review of the administrative decision-making process. The regime and its departments will continue to be immune from prosecution. Fundamental human rights are not guaranteed by the Maldive Constitution, and people are not treated equally. While there is provision for an auditor general, there is no proposal for an effective mechanism to ensure public scrutiny of disbursement of revenue. Certain sectors of government (for example, the Office of the President of the Republic, the Presidential Compound, the Ministry of Defence and National Security, and the Ministry of Finance) could still continue to spend along the current bottomless-pit model - i.e. with an unlimited budget. The question is will the proposed reforms succeed, and will they deliver the maxims of the Abuja Communiqué? Judge for yourself ! 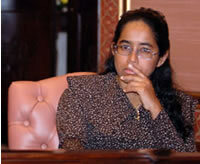 She is a non-elected presidential member of the People's Special Council charged with reforming the Maldive constitution. A niece of the head of the Maldive regime, Hameed is a daughter of the most powerful official in the regime who is also speaker of parliament. A beneficiary of New Zealand's generous bilateral aid programme, Hameed was educated at the University of Waikato in Hamilton where she completed her undergraduate, graduate, doctoral and post-doctoral studies. Hameed was an occasional overnight guest at the family home of this author in New Plymouth. As a student she was an intelligent and sensible woman with an independent mind, in spite of her shady family ties. As she discharges her new role as lawmaker, it is hoped that Hameed would provide good returns to the intellectual investment funded out of our taxes, and delivers on the side of decency that New Zealand has instilled in her.